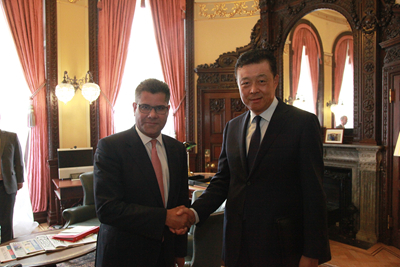 On 21 July 2016, Ambassador Liu Xiaoming met with new Parliamentary Under-Secretary of State in the Foreign and Commonwealth Office Alok Sharma of the UK. They exchanged views on China-UK relations and other topics. Alok Sharma said that he was very glad to meet Ambassador Liu on his fourth day in office. He recalled attending the welcoming dinner hosted by the Lord Mayor of the City of London in honour of President Xi Jinping during the President's state visit to the UK last year, and how deeply impressed he was by the successful visit. He stressed that the new British government attached great importance to developing relations with China, saying that China-UK relations was and would continue to be a priority of UK's foreign policy. The UK is willing to strengthen high-level exchanges with China, deepen practical cooperation, conduct close communication and coordination with China in international affairs and keep the strong development momentum between the two countries. Ambassador Liu spoke highly of the UK's emphasis on China-UK relations. Despite many uncertainties after the Brexit referendum, China has been sending clear messages that it will stay committed to building Global Comprehensive Strategic Partnership for the 21st Century and the "Golden Era" of China-UK ties. China stands ready to work with the UK to carry out the high-level dialogues and to further enhance bilateral communication and cooperation in the fields of economy, trade, people-to-people and cultural exchanges and in international affairs. On behalf of the British government, Alok Sharma expressed condolences and sympathies to the families of Chinese peacekeepers who were killed or injured in the attack happened to the United Nations Mission in South Sudan, and spoke highly of China's important contribution to UN's peacekeeping missions. Ambassador Liu expressed his appreciation to the UK side, and stressed that notwithstanding strong indignation and deep sorrow over the death of Chinese peacekeepers, China will remain firmly supportive of the UN peacekeeping operations and stay committed to maintaining world peace.